There are a number of ways for a company to raise debt in order to finance growing business and development needs. 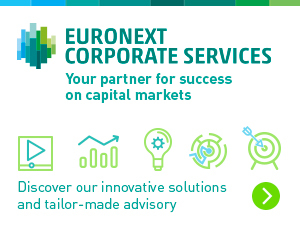 To help issuers find the best solution suited to their funding needs, Euronext offers a simple and efficient listing process combined with a choice of listing venue. By issuing debt securities through Euronext, companies gain access to one of the most secure and orderly secondary trading markets in the world, thereby benefiting from greater visibility and increased liquidity. In 2014 the corporate bond market well performed in the primary market (€54 billion was raised in non-financial corporate bonds alone) but also in terms of the development of products and services to facilitate access to the bond market. These include an initiative for first-time issuers with the development of the Euro PP market for SMEs, the development of green bonds supported by demand from SRI investors, and the increasing use of bond issues in international currencies, helping to diversify investor base and manage foreign exchange risk. 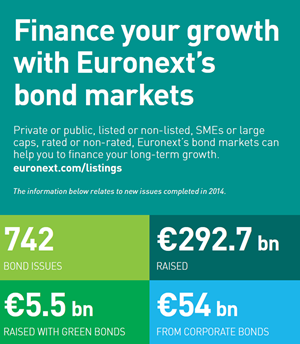 Private or public, listed or non-listed, SMEs or large caps, rated or non-rated, Euronext’s bond markets can help you to finance your long-term growth. A Retail focused segment for trading Fixed Income instruments in a regulated environment. Euronext Private Placement Bonds – EPPB – initiative extends Euronext’s private bonds offering by creating a dedicated offer on Alternext benefiting from all the attractiveness of our capital markets.